I’m pretty sure zucchini can do just about anything. Act like a noodle? Yup. Hide in a moist brownie? Check. Crisp up like a chip? Absolutely. 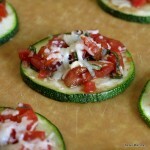 So, it was no surprise to me that it was spectacular in place of bread in low-carb Zucchini Bruschetta! The zucchini takes the role of bread in this recipe. A traditional tomato bruschetta mixture sits atop roasted (or grilled) zucchini. It’s topped with mozzarella cheese…or vegan shreds…or nothing at all. Any which way you make it, it comes out tasty! The zucchini forms the base of the bruschetta. It should be tender, but firm. Cut the slices about a 1/4 inch thick. It doesn’t take too long to achieve the perfect “doneness.” Place zucchini slices on a baking sheet coated with cooking spray. Lightly (very, very lightly) coat the top side with olive oil. Bake the slices in a 375 degree F oven for about 2 minutes. Flip the slices, lightly coat the tops with olive oil and cook 2 minutes more. Remove the zucchini from the oven and top with the tomato bruschettta mixture. Sprinkle mozzarella cheese or vegan shreds over the top, if desired. Return to the oven for two minutes more. 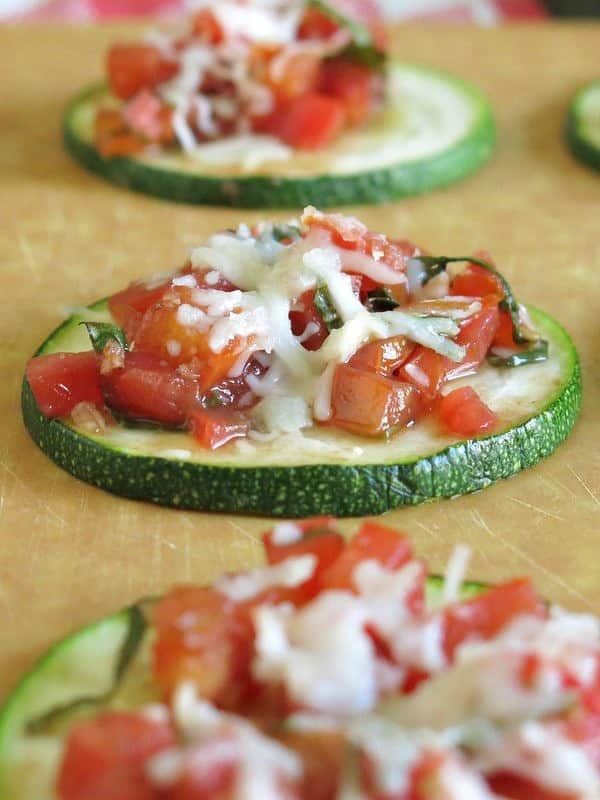 Enjoy zucchini bruschetta while it’s hot and before it’s all gone! I was motivated to compile a list of all the terrific zucchini recipes that I’ve seen around the internet from muffins and pancakes to fries. So many recipes, so little time. Sigh…But, I will leave you with one other inspiration that really makes you think outside the box: Grilled Zucchini Nachos by Two Peas & Their Pod. Amazing. There really isn’t anything this vegetable can’t do! 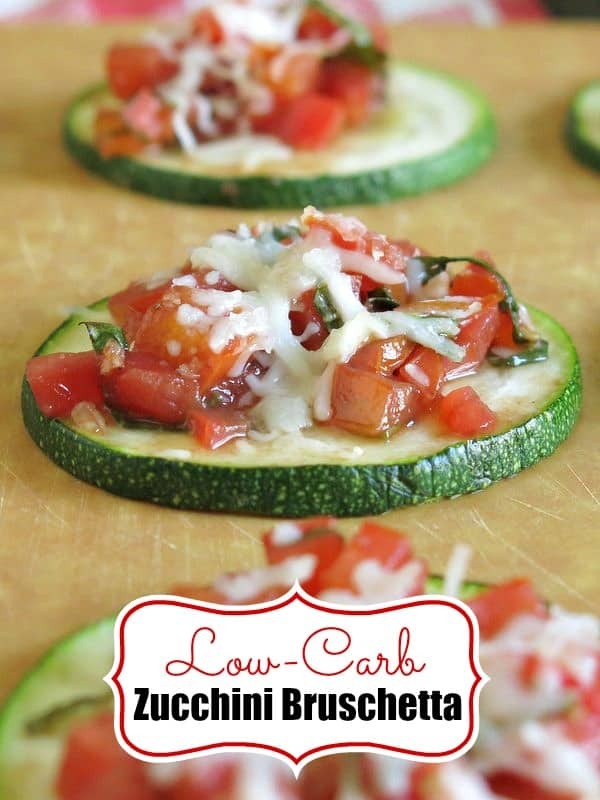 You won't miss the bread in zucchini bruschetta! 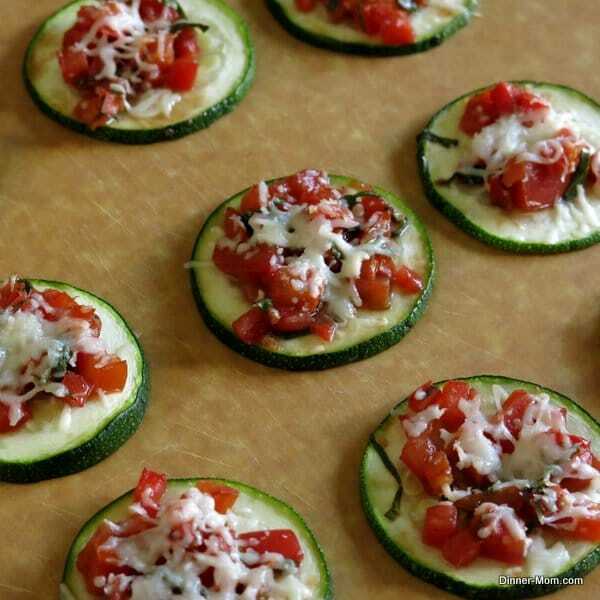 Fresh tomatoes, basil, garlic, balsamic vinegar and a sprinkle of cheese sits atop the roasted zucchini. 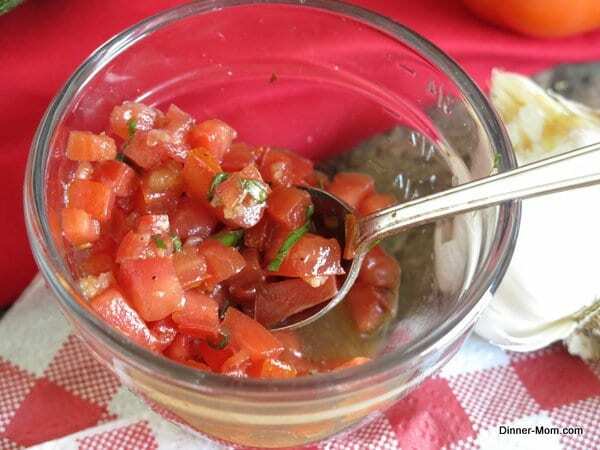 Mix together tomatoes, basil, olive oil, balsamic vinegar, sea salt and black pepper in a bowl. Set tomato mixture aside to blend while preparing zucchini. 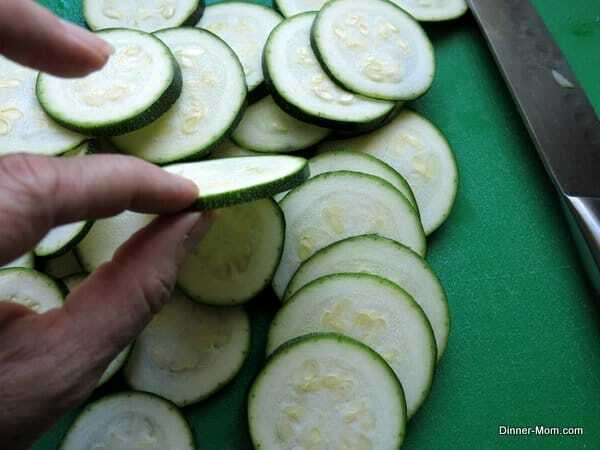 Cut zucchini into 1/4 inch thick slices. Place zucchini slices on a baking sheet coated with cooking spray. Lightly brush zucchini slices with olive oil. Bake in the oven for two minutes. Flip zucchini slices, lightly coat with olive oil, and cook for two minutes more. Zucchini should be firm, not mushy. Spoon tomato mixture on top of each zucchini slice and then top with shreds, if using. Return to oven and bake for two minutes more. Don’t miss a post! Sign up for Email Updates! is so fresh. You are very innovative and probably had a alot of zuccinni. I made this for dinner the other night and it was delicious! I couldn’t get the zucchini pieces to stay firm, so we ate them with a fork. Regardless, they were incredible! Thank you so much for the idea! We have tons of zucchini and are always looking for new ideas for them! Thanks so much for your comment! I find that the zucchini holds best if it’s sliced a bit on the thick side. But, a fork works for me too!! These are amazing! Am on a low carb diet at the moment and hosted an Italian themed dinner. Was getting major bread envy until I found this recipe! Over did the first batch so they were a little soggy but still tasty, used a timer for the second batch which were absolutely perfect! Thanks so much for sharing! I’m glad you like them! Thanks! Can’t wait for zucchini season to officially start again! Thanks for your comment. I hope you enjoy it!